MANILA, Philippines – Jordan Clarkson’s addition to Team Pilipinas wasn’t enough to break the “Korean Curse” as South Korea advanced to the Asian Games men’s basketball semis with a 91-82 victory over Philippines on Monday, August 27, 2018 in Jakarta, Indonesia. If there’s one thing about South Korea Basketball Team that its opponent should be worried about, that will be SoKor’s immaculate touch from the outside. As a welcome note, South Korea gave Philippines a flawless back-to-back three pointers. The Nationals tried to countered at the same spot but missed them all. Halfway through, the Koreans led the Filipinos by 10 but the Yeng Guiao-spearheaded team pushed a little bit harder and cut it to half in barely 1 minute. Philippines owned South Korea in the latter phase of the opener and fared well in closing the gap, 22-18. Naturalized South Korean and ex-PBA import Ricardo Ratliffe has been instrumental for his squad especially in the rebounding and inside scoring departments. But come 2nd quarter, he got into foul trouble and Philippines took the lead for the first time. Christian Standhardinger enjoyed his matchup against Ricardo Ratliffe and the Fil-German got himself into scoring rampage and put up twin digits under his name. Paul Lee and Stanley Pringle had a three point festival of their own that threatened the Korean Head Coach. Philippines came back and ended the 1st half with a 2-point, 44-42 lead. “Gilastopainters” continued to pour in significant points and Jordan Clarkson had found his rhythm in the 3rd quarter after a silent 1st half. South Korea trimmed the lead to just 1 with a 7-point swing from a handful of transition offense. Despite playing with 3 personal fouls, Ricardo Ratliffe still managed to square up against Beau Belga and Christian Standhardinger under the basket and reduced Philippines’ margin to just 1, 65-64 after the 3rd period. South Korea re-captured the lead as the deciding quarter was unfolded. The Koreans didn’t only dominate Philippines in boards but their outside shooting was reignited. Under 3 minutes remaining in the game, SoKor’s lead had gone up to a dozen and the Koreans started to melt the clock. Jordan Clarkson tried to fight back but time wasn’t on Philippines’ side and South Korea continued its offensive onslaught for the remainder of the quarter and wrapped up their duel with a 91-82 sorry loss. South Korea moved up in the semis and awaits the winner of Iran versus Japan. As for Philippines, this loss denied the nationals a podium finish and will just give them a fifth place award depending on the outcome of the other quarter final games. 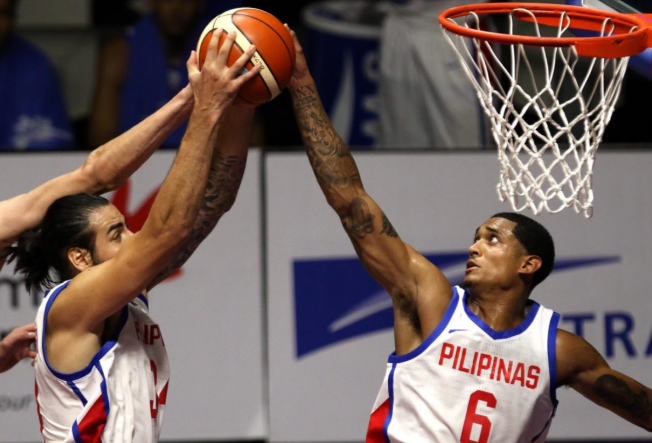 Philippines (82) - Clarkson 25, Standhardinger 16, Pringle 14, Lee 11, Almazan 7, Norwood 3, Belga 3, Taulava 0, Erram 0. Korea (91) - Ratliffe 30, Kim 17, Heo IY 17, Lee SH 11, Jeon 9, Heo U 6, Lee JH 1, Park 0, Choi 0. Quarters: 18-22, 42-44, 65-64, 91-82.